Do eye-feasting landscapes, drop-dead gorgeous scenery, and limpid waters strike your fancy? 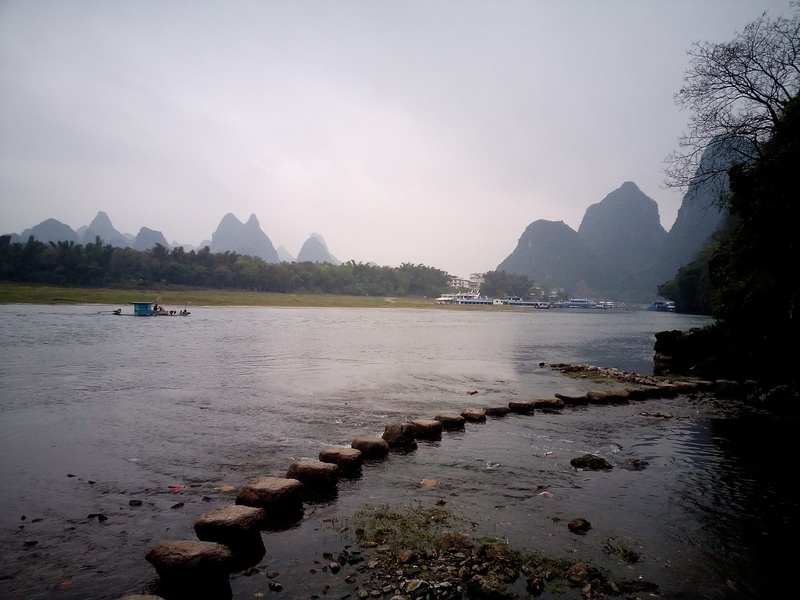 Then this post about Guilin and Yangshuo will play with your senses for beauty. Оn top of that, it will provide you with helpful facts about the fascinating Li River Cruise and how to do in the best way. Are you ready? Good, let’s start! Guilin (桂林) and the nearby Yangshuo (阳朔) are located in Guangxi (广西) Zhuang Autonomous Region. Guilin owes its name – “Forest of Sweet Osmanthus” – to the large number of fragrant Sweet Osmanthus trees located there. Both Guilin and Yangshuo, situated along the Li River or Lí Jiāng (漓江), are prominent for their karst topography and are one of the most popular tourist destinations in China. From Guangzhou Nan, we hop on a bullet train (CRH). And in around 2 hours, it takes us to Guilin (good job, CRH!). Before going there, I had heard of Guilin, but I always imagined it as a small touristic town. It turns out that Guilin boasts a population of more than a million people and is not as beautiful as I envisaged it would be. In addition, when we arrive there at around nine in the evening, it’s raining which does not add too much to its beauty. We struggle to find the hostel we are supposed to spend the night in. In the end, in a dark street and after a set of stairs, we find ourselves inside. I have not taken photos inside as it was not the cosiest place on Earth, but at least there are showers and heating inside the room. Who needs more, right? We wake up early the next morning and head to the station to take a bus to Yangshuo where the breath-taking river sights and karst mountains highlight the popular Li River Cruise. The weather is not very promising, but at least it’s not raining as it was in Guilin. To add up to the sensation, the hostel is much friendlier and cleaner. Simon and I are in a room with 10 more Chinese on top of the hostel from where a great view of the valley, where Yangshuo sits, unfolds. Without wasting too much time, we head for lunch. 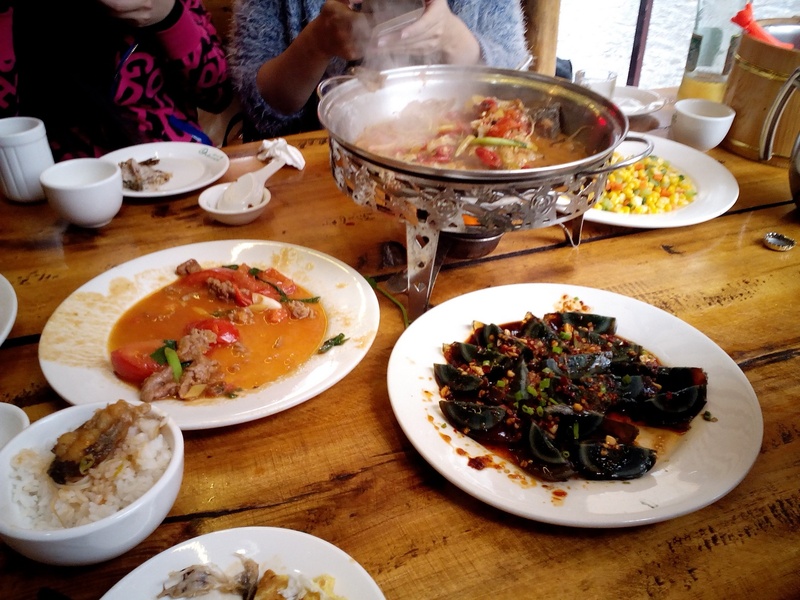 Beef with tomatoes, fried fish in beer, and spiced century eggs (皮蛋) are some of the local delicacies we order. As we are in China, they come with abundant amounts of steamed rice (米饭). Beef and tomatoes in the plate on the left, rice topped with “beered” fish in the bowl, and preserved eggs on the right. You either love or hate the eggs. I love them! What about you? After the hearty lunch, it’s time for some karst-seeing and taking photos near a small waterfall that empties itself into the Li River. After a lengthy photo-shoot, we decide it’s high time we took the Li River cruise and explore the magnificent beauty of Yangshuo’s scenery. On the way, we pass through a nice tourist market with fans in different sizes and mesmerisingly beautiful colourings. Reaching the “port”, our Chinese friends start bargaining and we end up paying 300 RMB ($45) for 5 peeps, which is quite the deal as we hop on two private bamboo rafts. The whole trip is around an hour with one stopover at a place, which is excellent for taking photos. A happy-3-friends (Sino-German-Bulgarian) selfie on the bamboo raft with a personal “driver”. In 10 minutes, we board the raft again to cruise us deep into the Li River’s canyon where the water is emerald. After admiring the magnificent panorama for a couple of minutes, the “driver” turns around and takes us back to where the tour started. In the evening, while exploring the village, we stumble upon a very interesting stand with T-shirts with famous faces on them. Osama Bin Laden, anyone? The next day, we take a bus from Yangshuo to Xingping. The latter is well-known as the main image on the reverse side of the new ¥20 note (see below for more info). The place depicts a fisherman riding his bamboo raft down the Li Jiang, meandering along the staggering karst formations. It is a little foggy but quite warm, as you may see from the photo below. 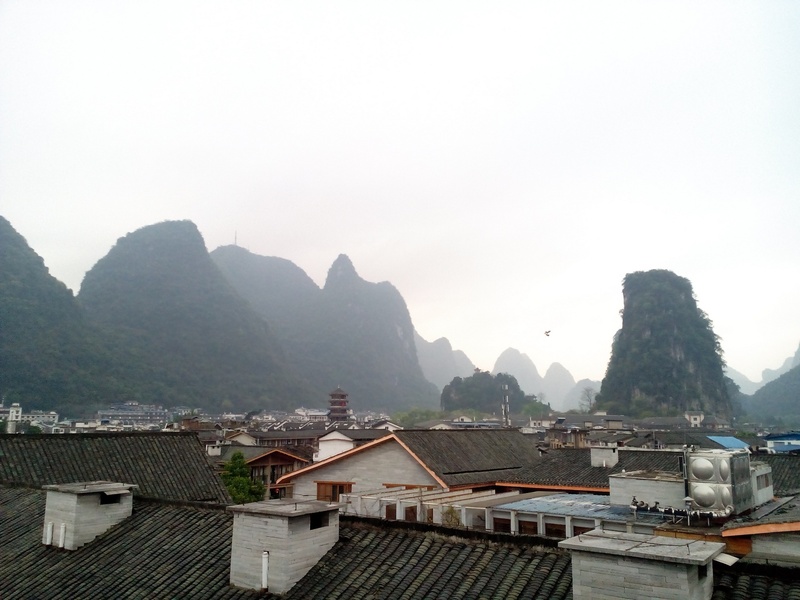 In the afternoon, we go back to Yangshuo. 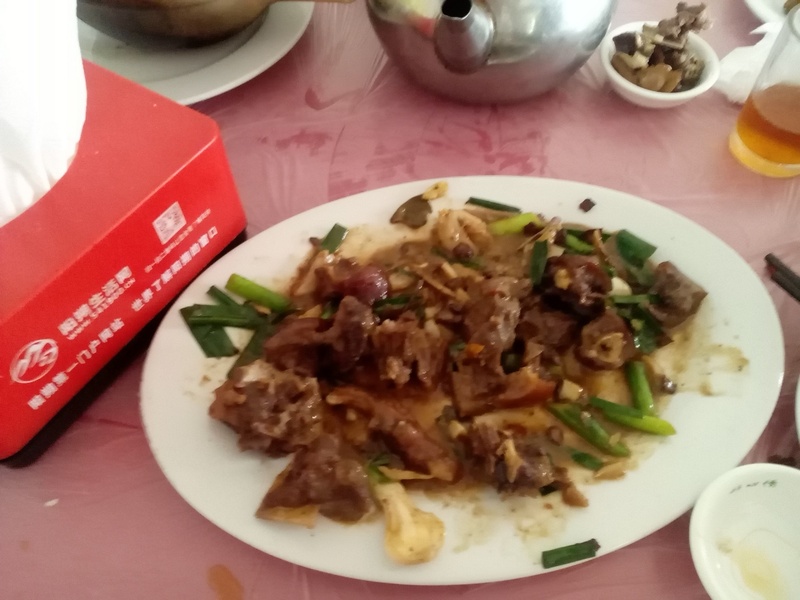 We enter a small Chinese restaurant where we treat ourselves to more local delicacies. One of them is on the picture below. Can you guess what the dish is, without opening the photo and without checking the hint in Google? On our last day, Simon and I head to the nearby mountain where the TV tower of Yangshuo is located. Due to thick fog atop, we don’t take any photos, but on the way down, I manage to capture a nice panorama of the village. Panorama from the mountains near Yangshuo. We hurry to check out of the hostel, take the bus to Guilin, and then another bus to its train station, where we hop on the high-speed train and return to Guangzhou. Since July 28th, 2014, Guilin applies a 72-Hour Visa-Free Policy in order to facilitate passport holders of more than 50 countries and regions to enjoy a visa-free trip up to 72 hours when taking an international transfer via Liangjiang Airport. Find more details about it here. There’s high humidity all year round. Guilin’s weather is defined by a subtropical monsoon climate, which comes with high humidity and four distinct seasons. According to a guide I found on the internet: “It can still be cold in spring in Guilin. 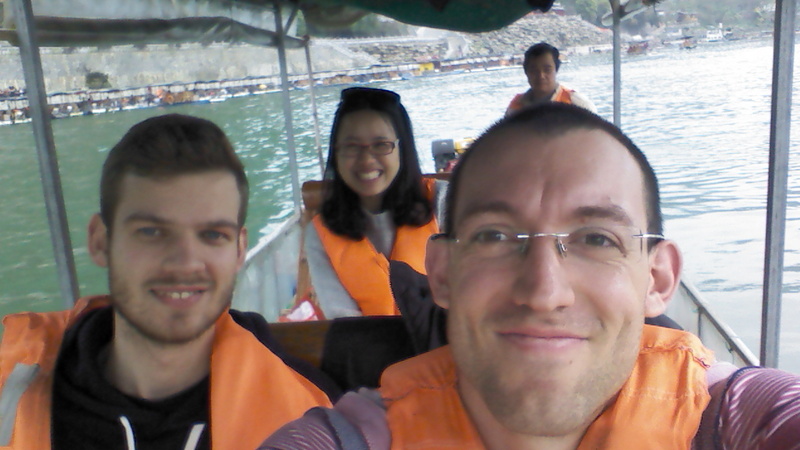 But when the sun comes out, it is the best time to cruise the Li River. The scenery along the river is pretty fabulous with warm sunshine and a breeze.” I cannot agree more. 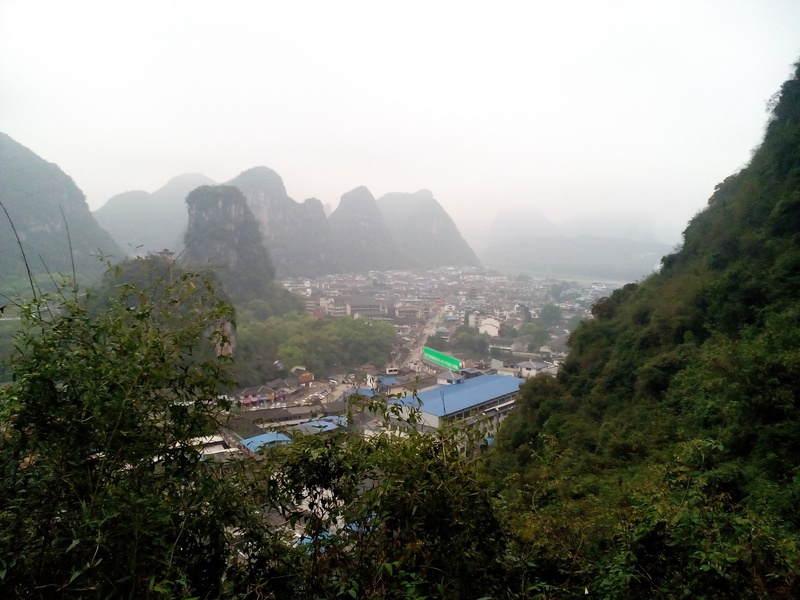 We were in Yangshuo at the beginning of March, and at night, you had to wear a light jacket. However, with a ray of nice sunshine during the day, the Li River cruise was excellent. Probably summer reveals an even more beautiful picture of the karst valleys, but be prepared for a lot of sweating. You can start the Li River cruise at different spots. While we did a short cruise on the Lijiang from Yangshuo, there’s another, much longer option. If you want to marvel at the mesmerising karst peaks for more than an hour, here’s what to do. Go to the wharf that’s south of Liberation Bridge in downtown Guilin. English-speaking guides are available only for the cruises that leave from Zhujiang Wharf. Bear in mind that these tours are with big boats, cost between 190 RMB and 450 RMB (depending on the season), and are usually packed with people. Have your passport ready. You’ll have to show your passport when booking and boarding the Li River cruise. Also, don’t forget to arrive at the departure spot around 30 minutes before the tour. If you can’t show a valid passport, another option is to visit the police station near the wharf, and ask for temporary ID proof. Bargain, bargain, and bargain. China is a lovely place for bargaining and if you are good at it, you can leave the place with many “trophies” at excellent prices. And here’s a very useful expression – tài-guì-le (太贵了) – that’s too expensive! Location – Guangxi Province, China, starting from Laoshanjie Ridge in Mao’er Mountain. Best section – from Guilin to Yangshuo. Immerse yourself in a scenery painting by floating on the meandering Li River. Take in the verdant karst peaks slowly as you pass. 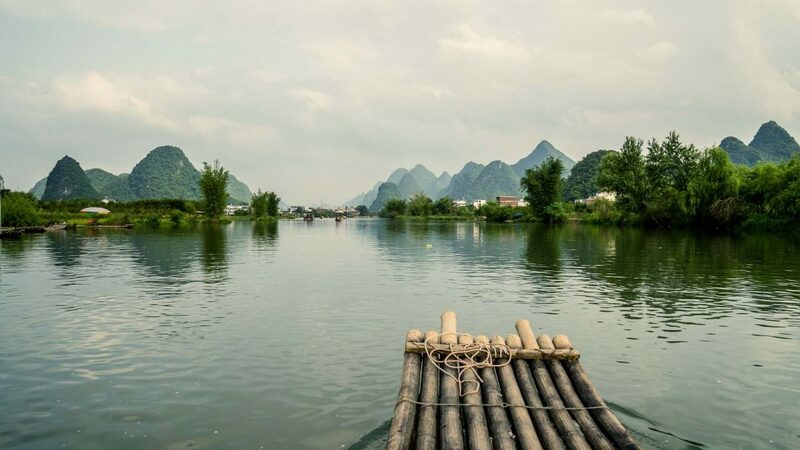 The best way to cruise the Li River – hop on a bamboo raft. If you’re an adrenaline junkie at least to a point, then drifting the river on a bamboo raft is your thing. That’s what I did, and I enjoyed every minute of it. Just don’t forget to put your life jacket on 😉 You can take a raft from Yangshuo, Yangdi, or the Crown Cave in Caoping Town. Numerous domestic and international flights go to and from Guilin Liangjiang International Airport (KWL) every day. The airport sits in Liangjiang, around 28 kilometres (17 miles) from the heart of Guilin. Most major Chinese airlines and a good number of international ones provide you with flights to and from Guilin. There are flights to/from 30+ Chinese cities and international spots like Bangkok, Hong Kong, Jakarta, Jeju, Kuala Lumpur, Seoul, Siem Reap, and many more. Important: During low season (November-March), flights might be cheaper than train tickets, so it’s worth checking them before you proceed to book. As of late, Guilin has three train stations – Guilin Railway Station (known as South Station), North Railway Station (north of the city centre), and West Railway Station (in Dingjiang Village). Regular and high-speed (bullet) trains run to and from all three stations, South Station being the major one. I recommend using the CRH high-speed trains. They are the fastest way to get to Guilin, and usually cheaper than flights in high season. *One-way tickets for first class. All prices and durations are approximate (last update at the end of March, 2019). 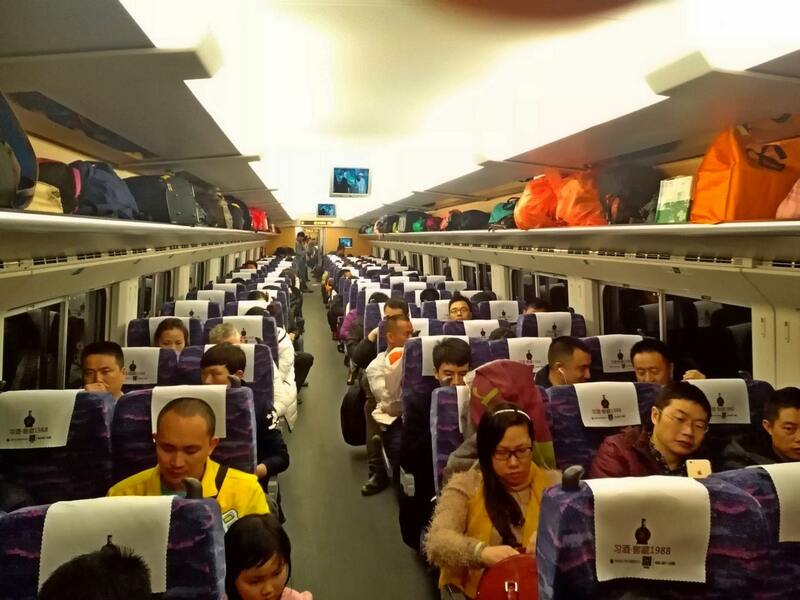 Important: The regular (normal) trains to Guilin take 3 to 4 times more, and are not much cheaper. If you opt for this option, bear in mind that it might be difficult to purchase sleeper tickets at the Guilin sales office because the city is a mid-route stop, not a terminus. Buy everything in advance. Inside the CRH bullet train from Guilin to Guangzhou. Guilin has three bus stations – Beimen, Chengnan, and the General Bus Station. Most buses that go to cities in Guangxi and Guangdong depart from the last one. The address of the General Bus Station is 427 Zhongshan Road (South), and it’s just 10 minutes on foot from Guilin Railway Station (South). You can hop on buses 1, 3, 11, 22, and 51 to go to and from the two stations. The majority of coach buses start out from the General Bus Station to neighbouring cities in Guangxi, Guangdong, and Hunan provinces. Now, comes the best part. Getting from Guilin to the gorgeous Yangshuo. The regular bus is a great choice, but if you wanna get lost in the karst magnificence of the area, taking the Li River cruise is your best option. All buses that go to Yangshuo arrive at its North Bus Station. The duration of the trip is around 70 minutes. Ticket price is 50 RMB ($7.5) per person. Buses leave from Guilin to Yangshuo every 15-30 minutes from 07:00 to 21:00 (7AM-9PM). Buses depart from Yangshuo to Guilin every 15-20 minutes from 06:45 to 20:30 (6:45AM-8:30PM). From Guilin’s International airport, there are direct shuttle buses that travel to Yangshuo. Find the Long-distance Bus Station, close to the Domestic Arrival Lobby, buy tickets and hop on the bus. The duration of the trip is around 90 minutes. Ticket price is 50 RMB ($7.5) per person. Shuttles leave from Liangjiang Airport to Yangshuo every 90 minutes from 09:30 to 20:00 (9:30AM-8PM). Shuttles depart from Yangshuo to Liangjiang Airport every 2 hours from 07:00 to 19:00 (7AM-7PM). Undoubtedly, the most beautiful way to ponder at the enthralling scenery of the Li River is to hop on a cruise. From Guilin, you have two options – taking a cruise from Mopanshan Wharf or Zhujiang Wharf. Both trips stop at the Shuidongmen Wharf in Yangshuo. The cruise duration is between 4 and 5 hours. The attractions along the way include the Crown Cave, the Nine-horse Mural Hill, and the Yellow Cloth Shoal. In low season, the cruise fare varies from 190 RMB to 380 RMB, depending on the type of boat you choose. In high season, the cruise fare varies from 210 RMB to 450 RMB, again depending on the type of cruise you choose. Important: Make sure you book your tickets in advance either from travel agencies or local hotels. If train is your cup of travel tea, you’ll love to hear that there’s a high-speed train going to/from Yangshuo. You can hop on a bullet train from three different stations in Guilin. All trains arrive at Yansghuo Railway Station. The ticket fares to/from West and North Railway stations in Guilin are around 25 RMB and 20 RMB for first and second class, respectively. The duration of the trip is exactly 24 minutes. The fare to/from Guilin’s Main Railway Station is 32 RMB and 26 RMB for first and second class, respectively. The duration of the trip is 40 minutes. Important: The railway station in Yangshuo is far from its famous West Street. When you arrive there, you’ll have to hop on an official shuttle bus to downtown. It costs around 20 RMB and takes around an hour. 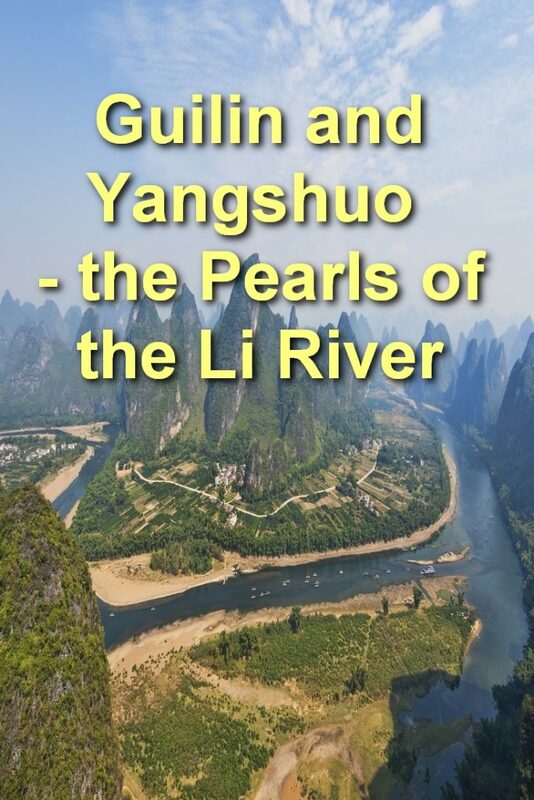 Now that you know everything about the Pearls of Guangxi – Guilin and Yangshuo – you only need to pack your beauty-yearning shoes and book a Li River cruise. Wow, stunning place to explore and very useful post too. We are hoping ourselves to visit this region! Great write-up! We have not scheduled our China trip, but when we do, this looks like a good thing to include, especially since there is a high-speed train! Thats handy to know about the 72 hours without having to get a visa, although China is a place I’ve love to spend a lot of time exploring – and eating I love Chinese food. Looks like you had a great time! 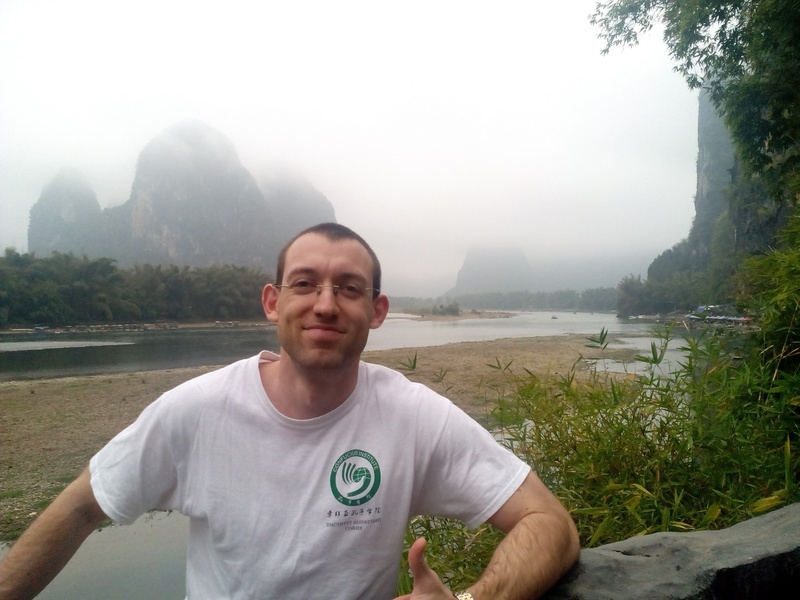 I’ve just returned from living in China for three years and absolutely adored Yangshuo – it’s such a cool place! Yeah, we did! Where did you live in China? China, and especially Yangshuo, is amazing! Those mountains are incredible, never seen anything like it before! I would have thought there would only be small villages there so it was a surprise to read how large the city actually is. Sounds like a trip you won’t soon forget. Yeah, it was indeed a great trip! Maybe try not to be upload pictures with you in them. Kind of blocks the view 😉 Good post, though. Thanks for sharing. Okay, I will keep that in mind 🙂 Thanks for reading! Great glimpse into that part of China and I love the misty photos. Looks like a fun and delicious trip. Thanks, Elaine, it was a bit misty but it added greatly to the experience! Good to know about the 72 hour visa rule, and also that you can bargain. Haven’t been to China yet, so thanks for sharing! You are welcome 🙂 In China you can bargain everywhere! The Li River boat cruise looks like a great way to see the landscape, not to mention a lot of fun. The no visa needed for visits under 72 hours makes this a great way to add a quick stop an itinerary throughout the region. Yeah, it was an amazing trip! 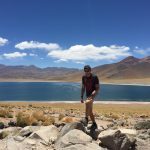 Before I wrote the article, I was not aware of the 72-hour no-visa thing, so I was very pleasantly surprised and decided to include it for a friendly advice to fellow travellers. One of my favorite places in the country – glad you enjoyed it! Mine too, thought I have not been around too much. It was awesome! I’m heading to China in the summertime and I’m happy to have read your post. I’m starting to plan already and I hope to see some beautiful scenery while I’m there! Oh, I am envious of you then! Do include Guilin and Yangshuo – one of the best places in China. Also, Yunnan.. And definitely the rice terraces near LongJi. Awesome! I love to visit China, just came back from nanjing tulou! Yes, these karst formations are one of the most beautiful natural phenomena I have ever seen. The waterfall adds to the sensation too! Definitely consider visiting it! Beautiful postcards from China.It seems you had lot of fun in Guilin and Yangshuo. The bullet train and food were definitely my favourite parts of my trip here! Your boat trip looked so good though. Yes, both were superb! You did not do the bamboo boat ride? Oh, you missed a lot! 🙂 When were you in Guilin? You are very welcome, Claire! I regret not having a better camera to capture the beauties of this amazing karst place. I would love to visit this part of China one day. Looks like such a contrast to the big cities like Beijing and Shanghai! It really is a contrast and a whiff of fresh and clean air. Check out the Longji terraces and Yunnan province as a whole – the Tiger Leaping Mountain, for instance. China was never on my list, but after reading so many informative posts, I may just give it a try! It should be on your list, Andreja. Its nature, cities, food, culture, history – everything is flabbergasting!